Bad heroes, or just bad? For all my cynicism around movies, blockbusters and shared universes, to say nothing about outright negativity when it comes to Zack Snyder directing anything beyond a hair spray commercial, I have been stupidly excited for Suicide Squad. The tale of a group of bad guys pressed into service by an even worse person, to do... something. It doesn't really matter, because we're here to see the WORST. HEROES. EVER. Classic Joker! This lead Viola Davis to threaten to pepper spray him if he came near her, which doesn't seem like the kind of thing the Clown Prince of Crime would take kindly to, but maybe it earned her some grudging respect. You have to admire the Squad's ('SKWADZ') commitment to who they are- bad, hard criminals. You have Harley able to hold her breath for five full minutes, or Killer Crock listening to recordings of other cannibals in order to preserve his craving for human flesh. 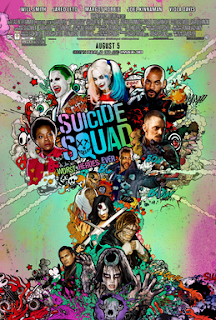 It's truly unsettling to see, and one of the many ways Suicide Squad stands out. The villain, in a story about villains really stands out: Rarely will you find one more menacing or twisted than David Ayer. Keeping the Squad ('SKWAD') imprisoned for months, and conducting twisted experiments on them is truly grotesque. It started as soon as they were in his thrall- forced into a 'therapy' session, where they where tricked into revealing childhood trauma, phobias and their deepest insecurities. These were then used against them as 'motivation' later. Truly devious. He pulled some very standard villain stuff, as well- forcing the Squad ('SKWAD') to fight each other, even inflicting a weird Stockholm syndrome on them, to where that whole SKWAD thing got tattooed on each other, probably because they had all bonded over surviving such trauma. Everyone, except Deadshot, anyway, but he barely appears at all except to comment on how he doesn't hate the Joker (he does) and to comment on how horny the rest of the Squad ('SKWAD') is (this is probably true). Deadshot is pretty lame, is what I am saying. In his greatest act of villainy, though, Ayer made a whole movie using the members of the suicide squad, and it was basically on par with the other current DC movies. For as fascinating as the Suicide Squad is, and what a great villain Ayer is, you would have thought they'd make a better movie.